While the nation was still savouring the success by way of a global record achieved by the Indian Space Research Organisation (ISRO) with the launch in mid-February this year of a record 104 satellites at one go, most of which were from abroad, history was scripted again on May 05, 2017, when ISRO successfully launched the South Asia Communication Satellite, the GSAT-9 that was carried into space by the Geosynchronous Satellite Launch Vehicle (GSLV-F09) the upper stage of which was powered by an indigenously developed cryogenic engine. Weighing 2230 kg at lift-off, the satellite which is designed to operate from a geostationary orbit, is expected to have an operational life of more than 12 years. The satellite has been equipped with 12 Ku-Band transponders that has been developed at a cost of Rs 235 crore. The total cost of the project inclusive of the launch is estimated to be around Rs 450 crore. This was the eleventh flight of GSLV and the fourth consecutive launch of GSLV-F09. With the intention of the newly independent nation making a foray into the regime of space exploration, in 1962, the Government of India had established the Indian National Committee for Space Research (INCOSPAR), a concept driven jointly by the first Prime Minister of India Jawaharlal Nehru and the legendary scientist Vikram Sarabhai who is generally regarded a the father of India’s space programme. Subsequently in 1969, INCOSPAR was replaced by ISRO, a far more empowered organisation under the Department of Space reporting directly to the office of the Prime Minister of India. During its nearly fifty years of existence, ISRO has built up an impressive record of achievements. Its journey into space began with the first satellite Aryabhata for the launch of which on April 19, 1975, the space agency had to seek assistance from the Soviet Union. 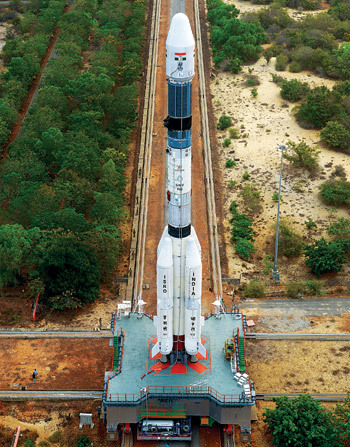 However, five years later, ISRO was able to successfully place in orbit the Rohini satellite with the help of the indigenously built Satellite Launch Vehicle-3. ISRO then went on to develop the highly successful Polar Satellite Launch Vehicle and the GSLV capable of carrying heavier payloads. ISRO also developed multiple satellite launch capability that enabled the agency to place in orbit numerous communication, Earth observation satellites and navigation systems such as GAGAN and IRNSS. ISRO accomplished Chandrayaan-!, a mission to the Moon in 2008 and the Mars Orbiter Mission in 2014. So far, ISRO has launched 226 satellites, including 179 belonging to foreign countries. ISRO is now reported to be working on Chandrayaan-II, human space flight, a mission to Venus and a probe to the Sun. 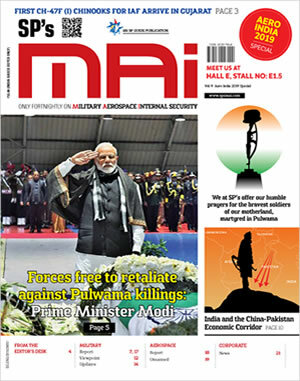 In the successful launch of the South Asia Communication Satellite, ISRO has once again displayed its level of competence and the capability to lead from the front, attributes not usually observed in the other Public Sector Undertakings in India especially those in the regime of aerospace and defence. Soon after assuming office in 2014, Prime Minister Narendra Modi had tasked the scientists at ISRO to develop a communication satellite that would be for use by the nations of the South Asian Association for Regional Cooperation (SAARC), an economic and political organisation of eight nations in South Asia which consists of India, Nepal, Bhutan, Bangladesh, Maldives, Sri Lanka, Afghanistan and Pakistan. At the SAARC Summit in 2014, Prime Minister Narendra Modi embarked on “space diplomacy” and made a commitment to launch a communication satellite for use exclusively by nations of the SAARC. This was a clear projection of his intent to strengthen his “neighbour first policy”. As per the plans drawn up by Prime Minister Narendra Modi, the satellite was intended to be a “precious gift” from India to the other seven nations of SAARC that would provide telecommunication links amongst them as also address the region’s economic and developmental priorities. From the point of view of the technology involved in the development and launch of the South Asia Communication Satellite and placing it in a geostationary orbit, it was well within the capability of ISRO and as such, the exercise would not have posed any extraordinary challenge to the capability of the organisation. However, the impact of the South Asia Communication Satellite will be more geopolitical in nature and its influence on the relationship between India and the other nations of SAARC will definitely be of significance. This has clearly been the thrust of the political leadership at the national level which is evident in the ideas and sentiments expressed by the Prime Minister in his message after the successful launch of the South Asia Communication Satellite, to the member nations of SAARC who are part of the scheme. The South Asia Communication Satellite in geostationary orbit is designed to improve the capability of each of the partner nations in the area of disaster management through better connectivity and speedy communication amongst them. In addition, the satellite which is equipped with Ku band transponders, will facilitate and enhance capabilities in other areas such as e-governance, teleeducation, tele-medicine, broadcast within the country, Directto-Home services and VSAT capacity with other linking services. While India is bearing the cost of the development and launch of the South Asia Communication Satellite, the partner nations will be required to build the required infrastructure on the ground. Unfortunately, Pakistan has turned out to be a major impediment for the success of the scheme and in turn could impinge on the unity and harmony of SAARC. The reason put forward by Pakistan for not participating in the scheme is that it has its own space programme. Pakistan initiated its space programme eight years before India did. Today, it has five satellites, but lacks heavy duty satellite launch vehicles and facilities for fabrication of satellites. But perhaps the primary motivation for Pakistan not to participate in the scheme is the ongoing reason is the ongoing conflict with India over Jammu and Kashmir as also mistrust barriers on ownership and control of the satellite and related systems. Pakistan holds that as the South Asia Communication Satellite is made solely by India, it cannot be called a regional project. As per a spokesperson from the foreign office, Pakistan is prepared to share its expertise and technological know-how and is keen to participate in the project only if it has a role in the development, launch and operation of the satellite. However, as India had made it clear that it would build, launch and operate the satellite, Pakistan would not like to be a part of the scheme. This unfortunately is a major blow to the spirit of unity of SAARC that has been and is the enduring objective of Prime Minister Narendra Modi. In the euphoria following the successful launch of the South Asia Communication Satellite, the implications of the involvement of China in some of the nations of SAARC ought not to be ignored. Sri Lanka already has a Chinese satellite and is in the process of getting the second one in 2018. Apart from Pakistan that is fully under her influence, China has made inroads into Bangladesh, Nepal, Sri Lanka and the Maldives. In the regime of space technology, Pakistan and Sri Lanka have launched satellites with help from China. Even Nepal, the Maldives and Afghanistan have held preliminary discussions with China on future satellite projects. India’s space diplomacy will have to factor in and aggressively counter the Chinese influence in the region. This will be a major challenge for the Indian leadership.